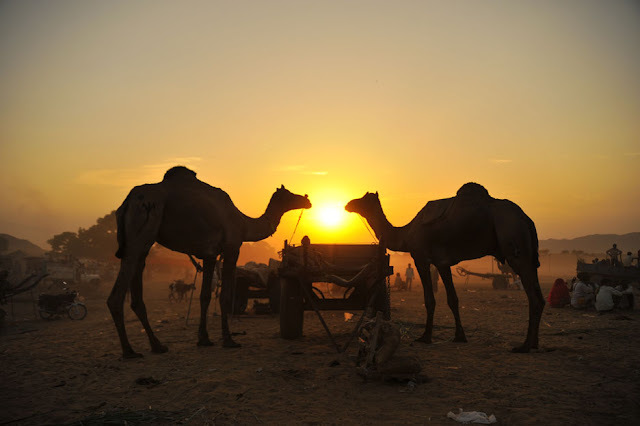 Camels mirror each other in the setting sun as I run to compose symmetrically. Nikon D700, Tamron 28-75 f2.8. Life changes, and each stage of my career is bringing with it new lessons and opportunities. These days, much of the work I am doing is governed by privacy ethics and laws and so my blogging has taken a down turn - as some of you may have noticed. And yet, today, during this usual lull at the end of every year, I find myself sorting through tens of thousands of images, hundreds of directories and a history of photography that I am proud to call mine. So, starting with this post, I think I am going to revisit my images and present their stories to you as often as I can. 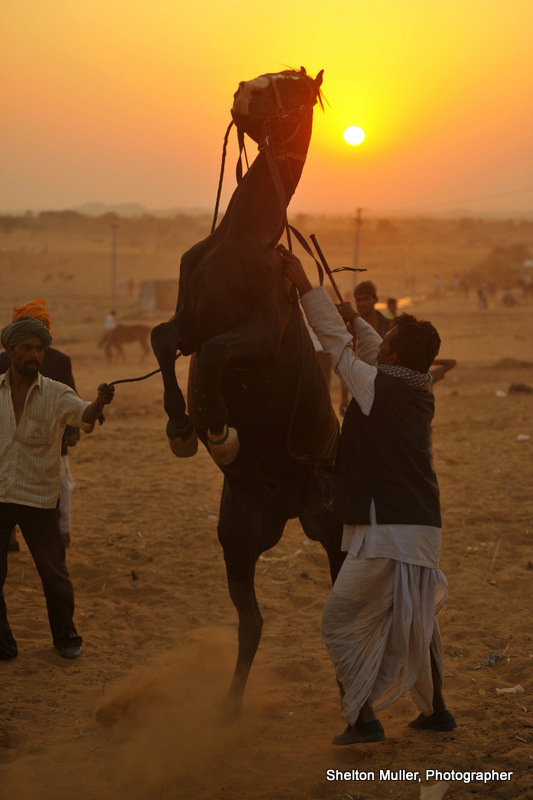 These images were taken at the famed Pushkar Camel Festival. At the time I was running a photographic tour for an old friend in the industry, Darran Leal. Darran's company, World Photo Adventures, is one the best in the business if you want an unforgettable and educational photographic experience. 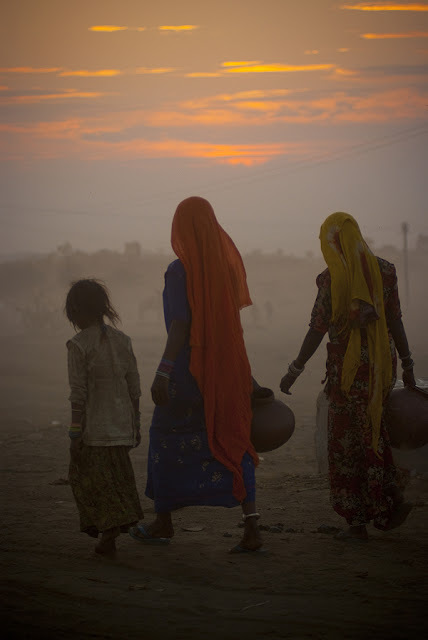 India was an experience I will never forget - on almost every possible human level. Walking through this festival, a festival at which tens of thousands of camels are bought and sold, there are photographs at every turn. The camels, their owners, the buyers, their families, the dusty landscape, the colourful culture - the list is endless. You are in a dusty, hot, overcrowded photography heaven. Documenting an event like this is difficult enough as video at 25 frames per second. One image at a time is even more difficult.The problem is not 'what do you take?' but rather 'when do you stop taking?'. This in itself poses a problem - the problem of prioritising. When you are in a situation in which there is just too much to photograph, it becomes a case of 'what to leave in and what to leave out'. Once you have eradicated the 'what to leave out' aspect, the 'what to leave in' is challenge enough, but less so. So what do you leave out?' To me, that answer then becomes about light. If the light is not in any way complimentary to the image, then leave it out - epecially when there are thousands of potential images complimented by great light. Returning the festival in the late afternoon, the light becomes more workable and interesting, complimenting each image with warmth along with more manageable highlight and shadow details. 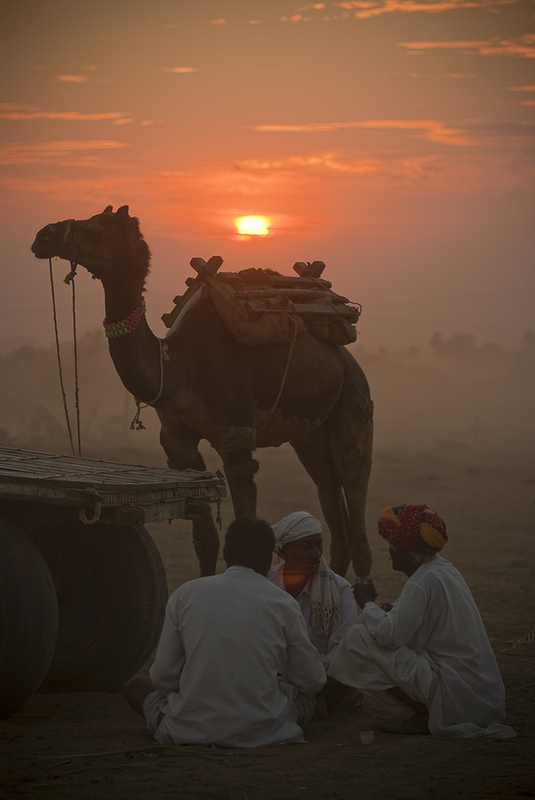 In these conditions, everywhere you point your camera suddenly assumes more natural capture potential - especially in a place like Pushkar and an event like the Camel Fair. Working with two cameras, each armed with a completely different focal length made the decisions and the process easier. So, the first port of call is the lens choices. To maximise the opportunities, I chose a wide angle to medium Tamron 28-75 f2.8 on one body and a 70-200 f2.8 zoom on the other. Because I prefer to produce images to the degree possible in camera, metering was manual, which is my usual preference. Then....well...you look, watch, point and wait for the moment. Conversely, you see and grab. There is no formula. You just get what you can - cursing when you miss, chimping when you hit. The chimping compensates for the cursing until after a while you realise that you are capturing images you have dreamed of taking since you were a boy who dreamed of traveling afar, camera in hand. When that realisation hits, you stop, take a breath of gratitude and continue your quest. There is no room for cursing or regret over any allegedly 'lost' images or opportunities. Right here, right now...this is the opportunity. Just concentrate, and enjoy. After all, you may never be here again. Tracy and Simon backlit with flash on the bridge at Lyrebird Falls. 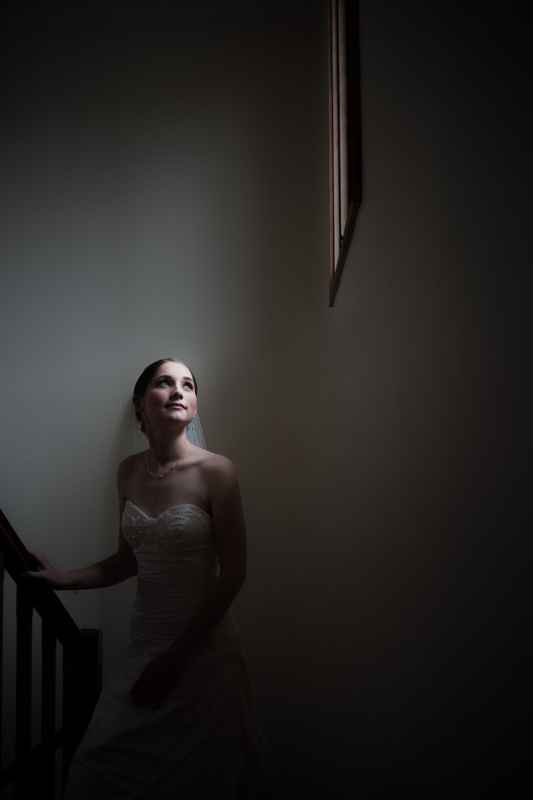 We recently had the pleaure of photographing Simon and Tracy’s wonderful wedding. The honour it would be to capture their wedding first became known to us when our friend, Greg Earl asked us if we were available on that upcoming November day. Naturally our answer was “yes”! Meeting Simon and Tracy at their initial interview just sealed the deal. 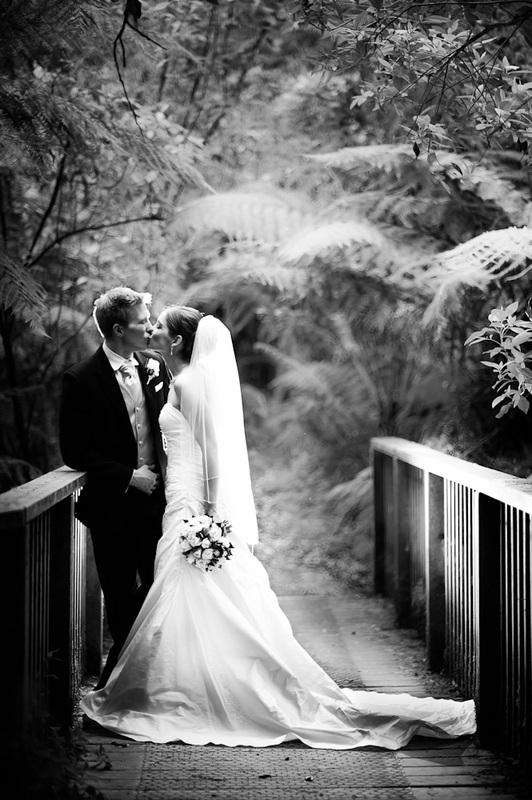 Their wedding took place at LyreBird Falls, in the heart of the Dandenongs. Surrounded by lush, verdant rainforests, this beautiful venue offers photographers some creative opportunities. Combine that with a young couple who love photographs – plus the time given to create them - and you have the makings of a great wedding – photographically speaking. Hey…either way it was a great wedding! Its just that we photographers view everything from our image-making perspectives…. We had the pleasure of staying on for the reception and enjoying a lovely meal, some great company, a few hearty laughs and the chance to enact ‘The Grease Megamix” with Tracy on the dance floor. What a hoot! For a gallery of images from Tracy and Simon's wedding, go to our Living in Pictures blog here. Thank you so much, Simon and Tracy. It was a distinct pleasure to photograph your wedding! It was our privilege recently to photograph an event that proved interesting in various ways. 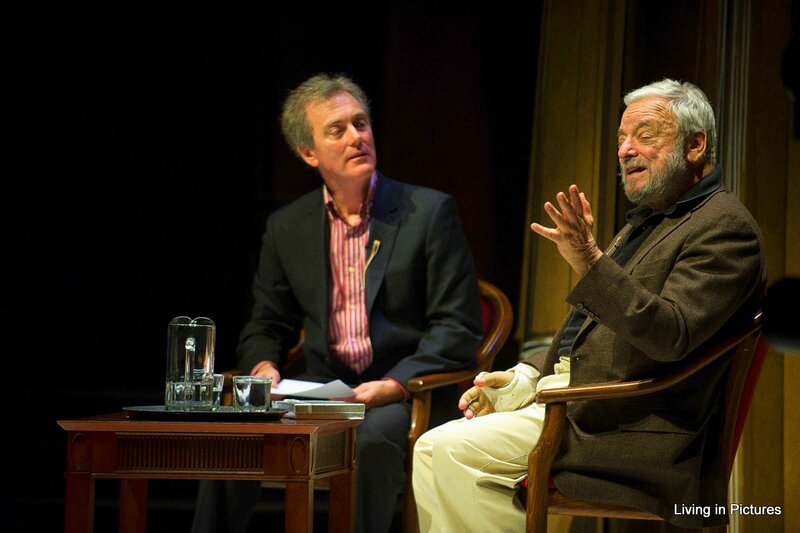 With "A Funny Thing Happened on the Way to the Forum" currently running at Her Majesty's Theatre here in Melbourne, the event was held to honour the visit of Stephen Sondheim, who wrote the music for this comedy. Stephen Sondheim required no introduction to the thousand thespians and fawning fans who gathered to hang with hands clasped on his every word. And words there were. He delivered some very interesing insights and humourous anecdotes about his work - insights on "West Side Story", "Gypsy", "Sunday in the Park with George", "Into the Woods" and many others. It was an interesting afternoon. 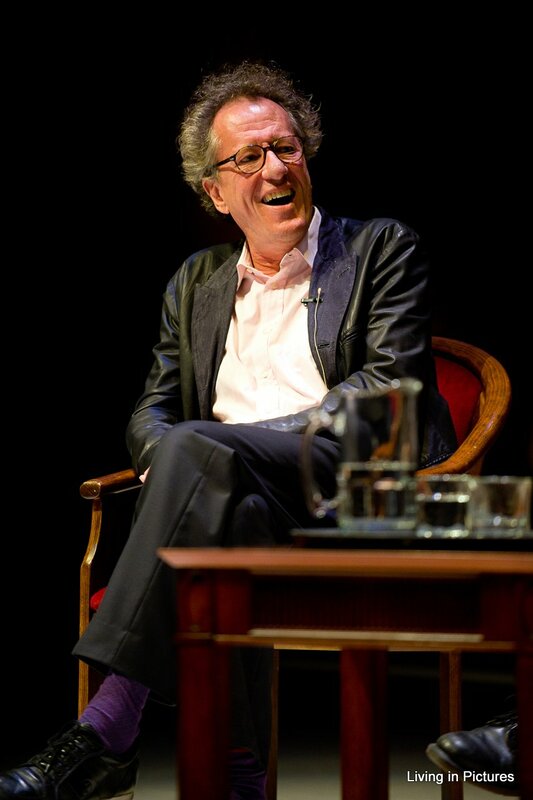 Even Geoffrey Rush turned up to join in the fun! So here we were, Tash and I, once again roaming the darkness of Her Majesty's Theatre for yet another set of performance shots and some obligatory pre and post-performance group photographs. The difficult thing about that was that Mr Sondheim is not one to have his photograph taken - something we were reminded of by everyone who was involved. But, we have all faced that haven't we? Mr Sondheim's averseness to photography was further made very apparent after the first song performance. Naturally, we were doing our best to remain discreet and silent during these songs, but the clunk of a shutter and mirror box assembly is not only ampilified by the silence of the audience, but also the acoustics of the building itself. Perhaps we need to buy some Leica M9's? I hear they are pretty quiet! Anyway....within seconds of the first song being sung and completed, Mr Sondheim requested that photographers respect the performers and not take pictures during their performances. That request was met with the thundering applause of the 1000 or so fawning fans. But these were the same people who laughed when he said that one of his friends had been hit by a bus. So, by my guess their applause seemed to be something we perceived to be more of the usual fawning and knee-jerk reactions than a well considered response. Either way...its not easy standing in a building while 1000 or so people clap at the request that you no longer do your job. But really? How do you respond in a situation like that? Tash came over to me during the next minute or so and asked pretty much the same question. I suggested that Mr Sondheim could do a few things with his comment that may or may not have been physically possible - even for a younger man. But I explained that while we will do our best - which we had been doing - we don't answer to Mr Sondheim. Our obligation was to our client, and so that meant that we kept shooting. 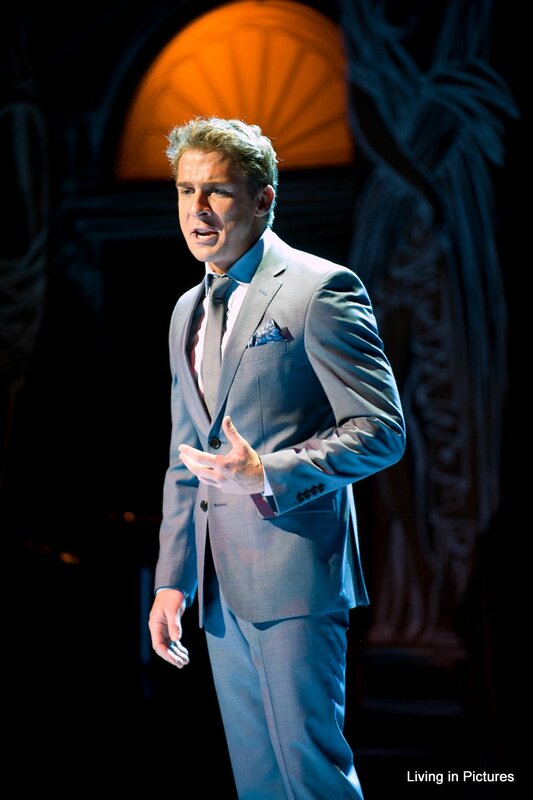 We would simply adapt our approach a little, perhaps grabbing the shot during the louder parts of the song, or that moment at the end when the song is finishing and the audience begins its applause. There is always more than one way to skin a cat. But in the end, with all due respect Mr Sondheim, my client dictates what I do, thank you.